A multi-genre DJ reputed for Swing / Electro Swing / Balkan Gypsy / Global Beats. French national based in London, Sacha began djing in the late 90s. Sacha has always mixed many genres and styles out (From 1920s Jazz to Rhythm and Blues to the latest Remixes. Obscurities from around the World to well known Classics). Sacha adapts his sets for each new occasion / gig. 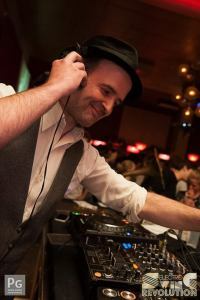 That said, Sacha is reputed for being one of the pioneers and specialists of Electro Swing, Balkan Gypsy and Global Beats djing in the UK. He co-founded and is the resident DJ of “Stranger than Paradise”, the infamous 12 year running Gypsy Burlesque monthly event, held at the Hootananny in Brixton. His mix “(S)winging it” is in the Top 3 most played Electro Swing mixes on Soundcloud, with over 500 plays every day and 348k plays in total. In the last few years apart from djing at themed events like: Electro Swing Club, White Mink, Electro Swing Revolution, Electro Swing River, Rumpus, Secret Cinema, Balkan Beats, Morning Gloryville, White Mischief, Carousel, Anti-Tapas, Movimientos, Small World, Goulash Disko and the London Burlesque Festival. Sacha has also become resident DJ at Passing Clouds and The Magic Garden. Latest International gigs: Geneva, Berlin, Dublin, Prague Salzburg, Madrid, Valencia, Rome, Milan, Genova, Ariano Irpino, Brussels, Split and Komiza (Croatia). All adding to his previous International CV: Paris, New York, Montreal, Hamburg, Marrakesh, Mykonos and Sintra (Portugal). Djing in support of Fanfare Ciocarlia, Balkan Beat Box, Shantel and Mahala Rai Banda in 2013. Organising sold out Gogol Bordello After Party with Eugene Hutz djing. Playing at the Bastille Day Ball at Kensington Palace Gardens alongside Electro Swing DJs: Bart and Baker. DJing in support of the Balkan Brass Battle concert (Boban Markovic vs Fanfare Ciocarlia) for Brighton Festival. He also organised the sold out Balkan Brass Battle After Party at the Komedia, Brighton. Djing at the Royal Festival Hall’s New Year’s Eve Party alongside Gabby Young, Eliza Carthy’s Motown Ceilidh, The Destroyers etc. And DJing at Ariano Folk Festival, Irpino Summer 2014. Previous gigs of note include: Djing for the BBC3 World Music Awards After Party, for the Cuban Music Awards and the Balkan Fever Festival. Artists he’s shared the bill with: Fanfare Ciocarlia, Boban & Marko Markovic, Shantel, Balkan Beat Box, Mahala Rai Banda, Amsterdam Klezmer Band, Dunkelbunt, Eugene Hutz (Gogol Bordello), Ivo Papasov, Boom Pam, Che Sudaka, Budzillus, KAL. But also Seun Kuti, Roots Manuva, Dandy Warhols, Miss Dynamite, Trojan Sound System, Jerry Dammers (The Specials), The Correspondents and General Elektriks. Festivals he’s performed at: Glastonbury, Bestival, Electric Picnic, Secret Garden Party, Ariano Folk Festival, Wilderness, Shambala, Glade, Isle of Wight, La Linea, Goulash Disko and Paradise Gardens and Boomtown in 2015.